Fic: Apocalypse! Alien Asteroids - Master Post. 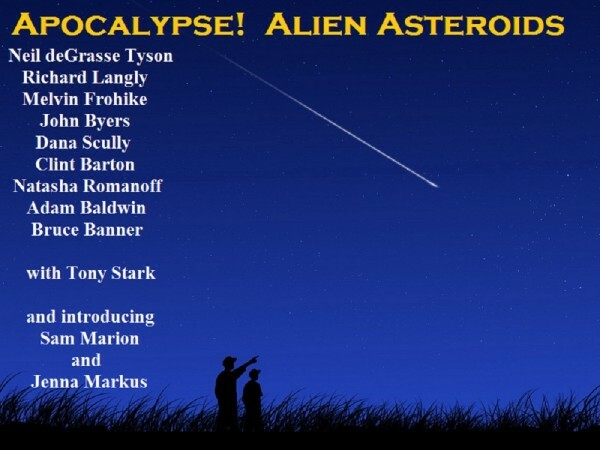 Characters/Pairing: Neil deGrasse Tyson, The Lone Gunmen, Scully, Natasha, Clint, various OCs, plus etc. Warnings: Language, Violence, Apocalyptic Themes, Character Death and blatant abuse of pop culture references. 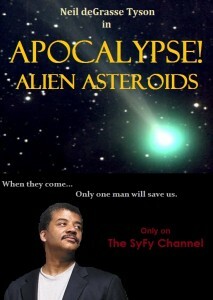 Summary: Asteroids are hitting the earth at an alarming rate and Neil really wishes he had never answered his phone. Author's Notes: Idek where this idea came from. Some random conversation with my sister and The BFF about the end of the world and then someone declared that if meteors were actually going to destroy Earth, Neil deGrasse Tyson would save us. Before I knew it, I was writing this fic, completely in line with any standard SyFy channel original movie. It’s my longest piece of fan-fiction to date. A lot of this story even surprised me. I actually went back and added some standard SyFy movie channel actors to this piece, because it’s not a SyFy movie without them. And I had to like research science stuff for this story, though only a little, because again, SyFy channel standards of science. Also I read Neil’s entire Wikipedia entry, which seriously, go read it. I think I am in love with this man now. Do you know he is practiced in four different styles of dance? Well, he is. Disclaimer: None of these people/characters/movies/TV shows belong to me. Nor does the SyFy channel. This story and the awesome ideas herein, however, do. 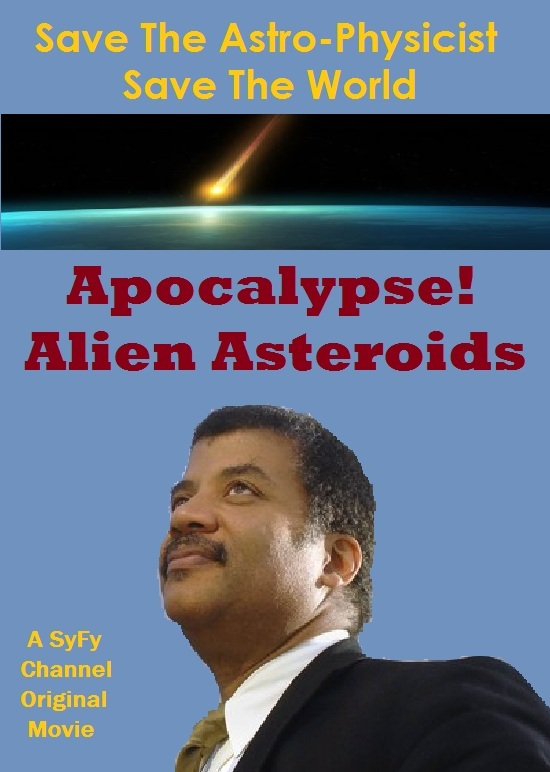 Dedication: This one’s for liptonrm, because you deserve all the cheesy SyFy channel movies in your honor and of course, because of your undying love for the man himself, Neil deGrasse Tyson. Pictures taken from the internet. Art made by me. Thanks: To the ever amazing and always awesome vikingprincess, for the beta, the reassurance and The Avengers knowledge. Seriously, babe. And to baylorsr, for the art beta and, of course, for the awesome-cool podfic - my first story ever to get pod-ficced! You are amazeballs to infinite! The Podfic can be found here. Lol Neil! I have to read just for him :D congrats on finishing such a big story! Isn't Neil just lovely? I liked him a lot before writing this, but after reading up on him for this story, I am kind of in love. congrats on finishing such a big story! Thanks! I feel like a grown-up writer now or something! ;) Hope you read the story and enjoy, darling! I LOVE all of the covers your sister made. Actually, I made all the art. My sister just beta'd it - if art betaing is a thing you can do - by, you know, me constantly calling her into my room and demanding she give me her opinion on how eveything looked and what I should change. The Podfic is all her though! Hey, I want to rec your story - can I use one of the art pieces in my post? If yes, I'll go back and edit the art in later. My pleasure! And thanks, I'll do that.